I’m not sure how this would run in a casting advert as actors can be a tad tricky when it comes to casting and being typecast. Well, for our new short film “Like Father Like Son” we need an actor to portray a compassionate yet authoritative figure. Shouldn’t be a problem, I hear you all say. Sounds like an interesting part for an actor. I’ll do it. Just the type of role I’ve been looking for. The thing is the part is really about what size feet you have. Let me explain. We need an actor who can wear a size 9 and a half. And as we all know every pair of shoes, trainers, boots, and socks has a different idea on what size it is, what size it wants to be and what size it was before it rained. 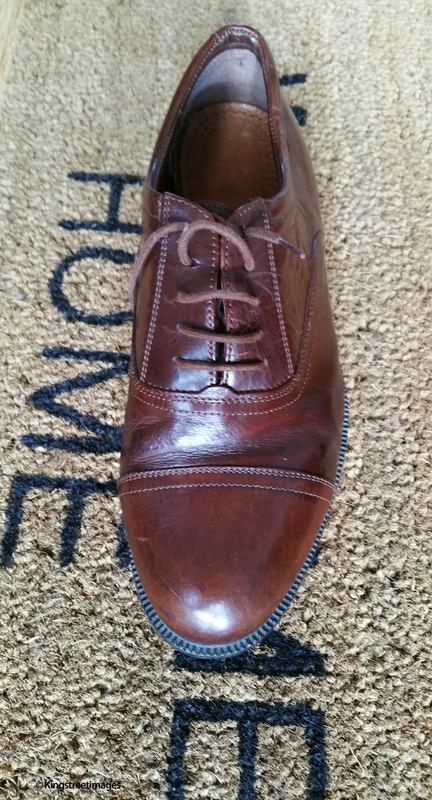 Our actor is being cast on what size foot he has as we have a fantastic pair of Clarks’ shoes that will really work for the film. It’s not as if we’re casting for a superhero part and you have to fit the elaborately designed costume it’s just we found the shoe that would look really good striding along a concrete path on the way to knocking a door. It’s not a complicated part but the style of the walk and the shoe will make all the difference. We may not even show the face of the actor, as the message has to come from the stride and the shoe. This is one of those parts when you think what will the actor get out of it? Could the actor say that they were the confident brown shoe on the concrete path on the way to the knocker? Would you even put it on your CV? Or do I offer assurances that the part will feature more than some feet and a hand knocking a knocker? And how would the actor feel if we were then to over-dub their footsteps with our own created foley? Would that be like having James Earl Jones dub your voice in Star Wars?